Spring is totally in the air around here! Today was warm, fresh and beautiful with green grass shooting up everywhere and trees showing off their beautiful flowers. Ahhh… who doesn’t love spring?! Wait… you must all be wondering what I am talking about because we don’t have spring in Honduras… sorry! I am actually in the states with my in-laws right now! We are here for a few weeks for my brother-in-law’s wedding and visiting a couple churches. We are so glad to be here! Anyway, spring is a beautiful season of new life, warmth and amazing colors that stretch up to the sky. It is a so fitting that Easter falls in the spring season… the resurrection of the earth after the long, cold winter is a beautiful sight and is a visual reminder of the resurrection of our Lord Jesus Christ! He overcame death and gave us a future & hope! Awesome! Now, I want to share with you a simple & yummy-tummy recipe of Buckwheat Cakes… along with a surprised visit from a honey bee! This little guy came buzzing along and decided to check out the cakes & slurp up some honey while I was shooting pictures. I was actually really grateful that he came along because I wasn’t too happy with how the pictures were coming out. Before he came along, the pictures looked flat and boring. I just love how the pictures came alive with character and life with him hanging out there and being a bee! LOL!! Okay, okay… I’ll stop talking about him. The cakes are amazily simple to make and so good. I love the smooth earthy flavors and rich texture. If you are not a big fan of plain buckwheat, you can go half and half with whole wheat or spelt to tone down the buckwheat flavor a bit. I also like that this recipe is gluten-free and buckwheat is actually a seed, not a grain. Its phytic acid is much lower than the grains… making it much easier to digest and does not require a long soak. I acutally prefer to soak it close to 24 hours because we really enjoy the nice tangy kick… great with ripe fruits on top. Here I topped it with raw mango butter, butter and raw honey. I bet blueberries would be fantastic too! Soak flour with liquid in a warm place for 12 to 24 hours. Lightly beat the eggs and pour into the soaked flour. Stir in the rest of the ingredients and thin the batter to desired consistency with water if needed. Cook on a hot, oiled griddle or cast-iron skillet. These pancakes cook slower then unsoaked whole grain flour or white flour pancakes. When bubbly on top and golden brown at the bottom… flip over and cook for a few minutes till golden brown. Top with mango butter or your choice of fruit, butter, raw honey and a honey bee (optional). Enjoy!! Have a great week and don’t forget to check out the giveaways and enter for a chance to win 2 ecousable bottles or an Action Baby Carrier! « Just Making Noise´s One Year Anniversary! Ok – so my mother and I have been going around and around about soaking grains. I contend that you can literally soak the flour in the liquid you’re going to use in the recipe, and then just keep going with the recipe after however-many-hours. She contends that you have to soak the seed, then throw out that liquid and grind the seeds (once they’re dry) and then make the recipe. Which way is best? Does it matter? Thanks! These pancakes look fantastic! These look amazing! I love them, and will be making them soon! Kelly – yes, it is a once in a lifetime kind of picture! Thanks! Jenn & Rachel – Thanks! I hope you do try them and let me know what you think. What an amazing shot – delicious looking pancakes with a honey bee to boot! Thanks for sharing this recipe. Definitely one to make for my GF hubby. Thanks. I love spring. I really miss it and hope to experience it soon. Love the pancakes. I might use a combination of both as we don’t have 100% buckwheat flour here. Enjoy your time in the States. Take care. Aw I love the cute little bee in the picture! 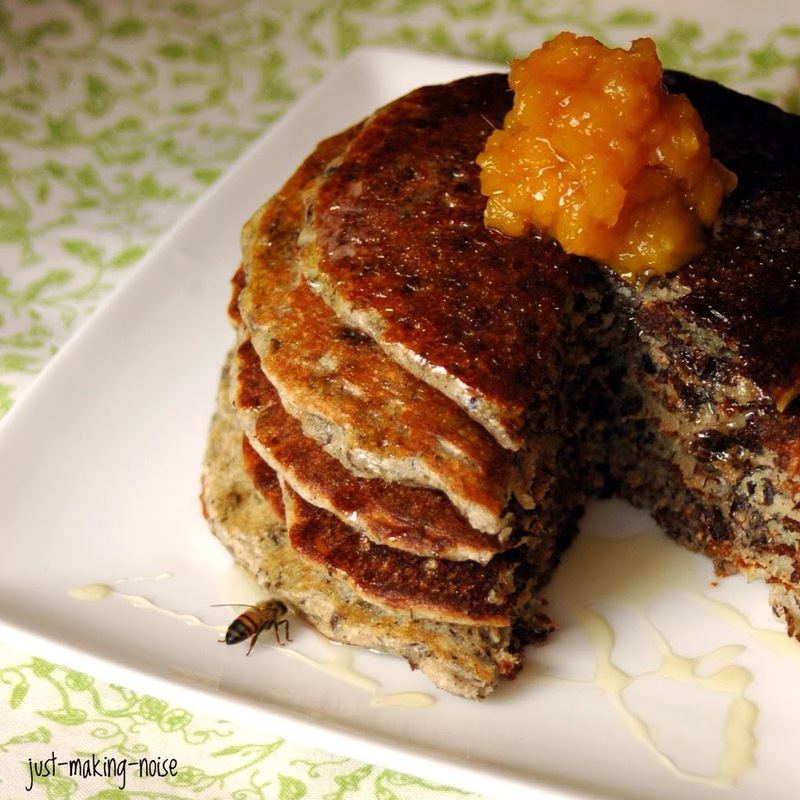 Great recipe – I haven’t tried 100% buckwheat cakes, but I will now! I love the nuttiness of buckwheat flour. And soaking the flour overnight makes such a huge difference in the texture of the pancakes. Thank you for posting this recipe. Being a buckwheat lover, I couldn’t wait to try these pancakes. Thus far I’ve made them three times – and the first two batches did not turn out well. Here was the problem: I used unsweetened kefir the first time and a buttermilk/yogurt combination the second. The kefir made the batter rise beautifully – but the pancakes tasted terribly bitter. With the buttermilk and yogurt combination I did not notice any rise, and the batter was still too bitter to really appreciate the distinctive flavor of buckwheat. I am on my third batch – and using soy milk. These cakes are turning out well and have a nice buckwheaty flavor. I am also using YS Organic raw buckwheat honey. This brand has a more noticeable buckwheat taste than some other buckwheat honeys I’ve tried. Made them without eggs (to avoid the smell) for breakfast. Husband liked it. Nice taste. Thanks for the lovely recipe. Wonderful! So glad you both enjoyed it!